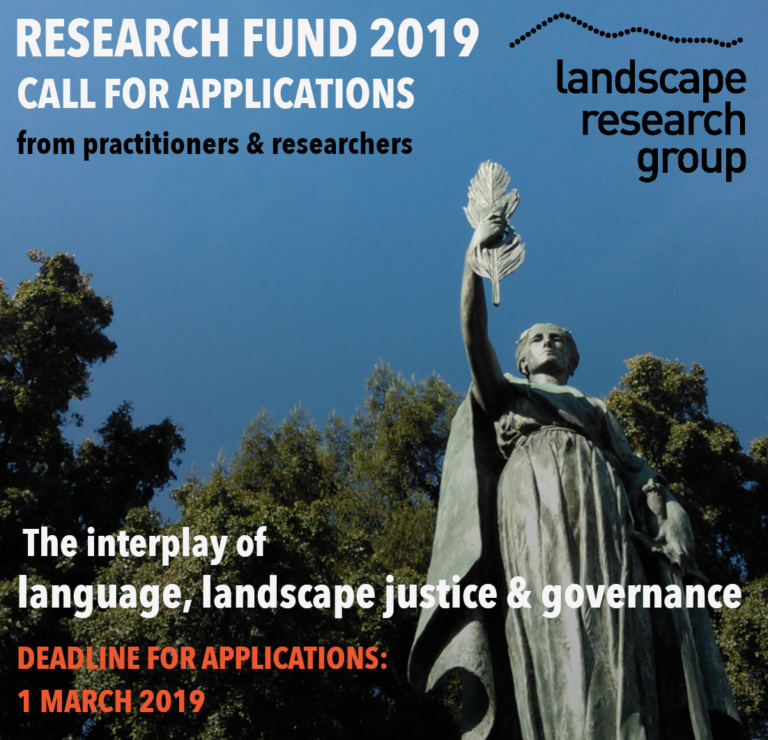 The Landscape Research Group (LRG) is pleased to announce our 2019 Research Fund. The 50th Anniversary Research Fund was created in 2017, and it is our plan to continue with an annual Research Fund to support a small number of high-quality projects which align strongly with LRG’s current strategic priorities, as outlined in our Research Strategy and specified below. We particularly welcome applications from early career researchers and practitioners in any field of landscape, and projects with a strong element of collaboration and exchange. Download full details, eligibility criteria and application form here. Deadline for applications is 1st March 2019. Landscape justice and landscape governance are two of the four themes highlighted in our Research Strategy. According to it, landscape justice is concerned with issues of access and exclusion, ownership and dispossession, connection and disconnection within and across communities, societies, generations and species. It concerns decision-making power and disenfranchisement, and fairness or lack thereof in the distribution of the potential benefits deriving from landscape. Landscape research in this area considers who has voice and power in landscape contexts, and how justice, democracy and citizenship are exercised. Due to the popularity and ongoing relevance of the landscape justice theme, which was the focus for the 50th Anniversary Research Fund, we are continuing with the theme for 2019. However we would particularly welcome projects focusing on the interplay of language (broadly understood), landscape governance and justice. This was one of the main themes that arose during our Landscape Justice Debate in December 2018, and the point was also made that language we used in speaking and studying landscape impacts on the nature of landscape research, the subject matter, the participants and the outcomes. research into the impacts of the language used in communicating ideas and issues around landscape with different audiences. “Language” is here understood in the broad sense to include visual/pictorial/image and tonal based forms of language, as well as verbal and written language. projects and activities that create opportunities and mechanisms for the generation, dissemination and/or use of knowledge, understanding or insight into landscape justice. * The project completion date refers to the main project activities. It is accepted that some activities, particularly relating to project outputs, may continue on after this date (e.g. where a paper has been submitted to a journal for publication but has yet to go through peer review and be published), although it is expected that continuation of activities beyond 31st December 2019 will be avoided wherever possible. Applicants should specify a project timetable in Section 2 of the Application Form and, where an activity is anticipated to continue beyond 31st March 2020, this should be explained and justified.